The local farmer’s market had some beautiful zucchini flowers that I was able to use in a recipe from Mario Batali’s Molto Italiano cookbook, which has over 300 “simple” Italian recipes to cook at home. The zucchini flowers are washed and the flower stamen is removed. The flowers are then stuffed with a mixture of goat cheese, egg, and scallions. The recipe calls for goat ricotta, but I used a soft goat cheese, and regular ricotta would probably also work, although I like the tanginess of the goat cheese. 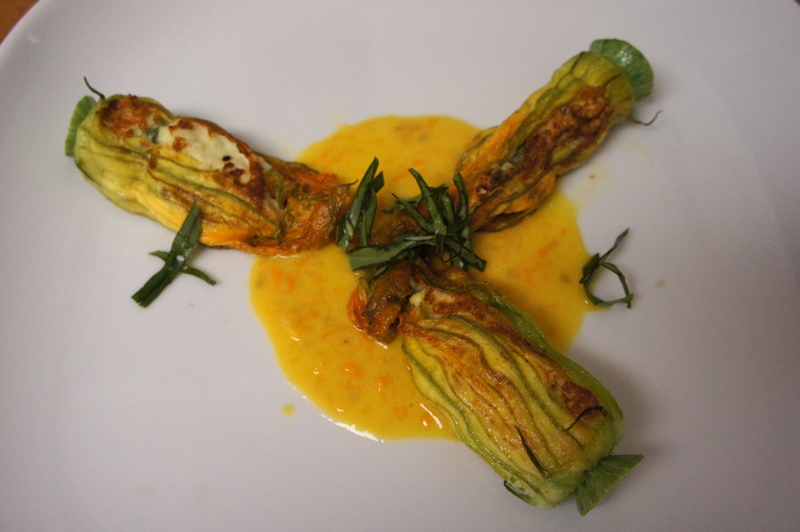 The stuffed flowers are then lightly sauteed until golden. A simple tomato vinaigrette and fresh basil finishes the dish. Beautiful, bright, fresh, easy appetizer. Link to Molto Italiano here. ad hoc is chef Thomas Keller’s “casual” restaurant in Yountville, Napa Valley, CA. Easier to get into and less expensive than Chef Keller’s other restaurants like The French Laundry or Bouchon, nevertheless the food at ad hoc is still prepared at a very high level. Each night there is a single set menu that is served family style, often featuring vegetables from the French Laundry gardens. The dinner starts with some delicious freshly baked bread and butter. The menu on the night that I went started with a Salad of Baby Mixed Greens with red radishes, sweet onions, fatted calf salami, castelvetrano olives, sliced almonds, buttermilk dressing. The main course was an Herb Crusted Lamb Sirloin, served with smashed fingerling potatoes, ramp leaf puree, pickled bulbs, sautéed asparagus with mix mushroom ragu. The lamb was perfectly done and the crispy potatoes were great. The highlight of the menu was the supplemental course of Crisp Pork Belly, haricots verts, yellow wax beans tomato marmalade. Crisp. Pork. Belly. This was followed by a cheese course of Pantaleo, a goat milk cheese from Sardinia, Italy, an interesting fennel & celery agradolce, and herbed walnuts. Dessert was Ginger Pain Perdu, toasted coconut ice cream, caramelized bananas. The brioche was toasted beautifully with a hint of ginger, complemented by a salty caramel sauce with the bananas and ice cream. $52 for dinner, plus $14 for the supplemental course, and $34 for wine pairing. 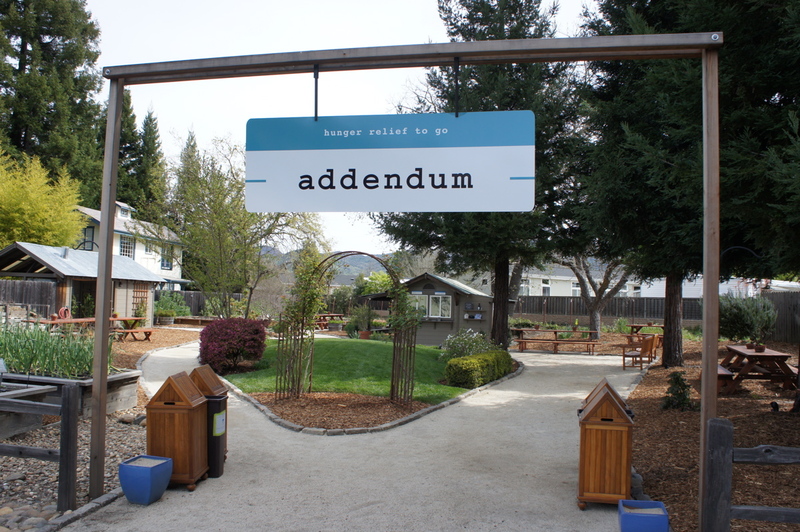 addendum is a beautifully landscaped picnic area behind ad hoc where they serve box lunches on Thursday-Sunday, with a choice of either buttermilk fried chicken or barbecue. The fried chicken was delicious – three pieces of brined chicken with a perfect crunchy crust. This was served with a buttery rich, delicious piece of cornbread, swiss chard with bacon lardons and potato salad. Dessert was purposefully underdone chocolate chip cookies. addendum is a really nice place to have a weekend lunch in Napa Valley. $16.50 for box lunch, $5 for dessert. Link to the beautiful ad hoc cookbook here.